It was baby-season for some of the antelope, or so it seemed. 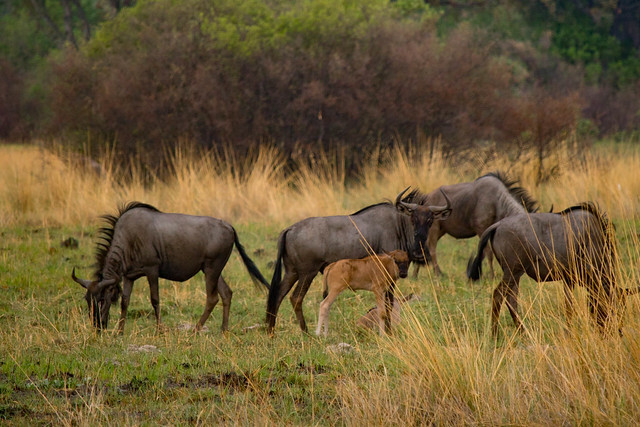 In addition to the baby impalas that were dropping all over, we found a few baby wildebeests when we were at Kwara Camp in the Okavango Delta. 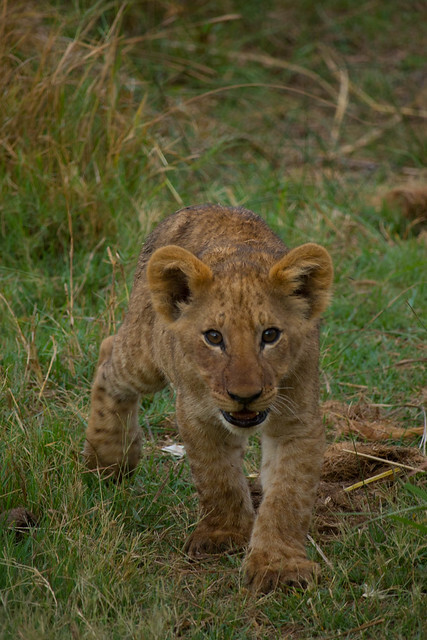 This little one was shy, but I can’t blame him, given the pack of wild dogs feeding in the area. 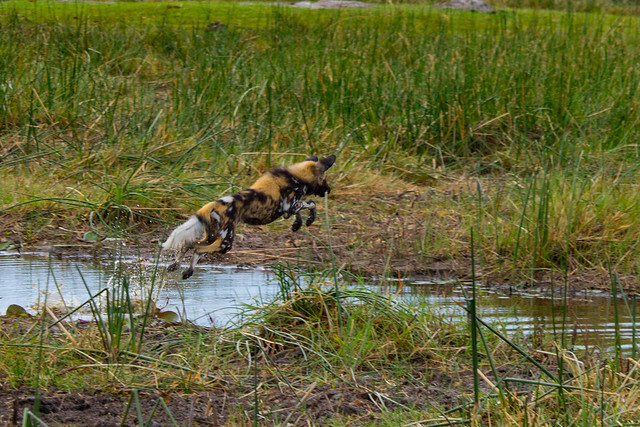 On a morning drive in Kwara, we had come across a pack of the wild painted dogs who were snacking on baby impalas. After felling and finishing a couple within about 10-20 minutes, they set their sights on something larger across the water. Our guide knew that they would have to jump to get over there, and positioned us to get a view. Our wait paid off! 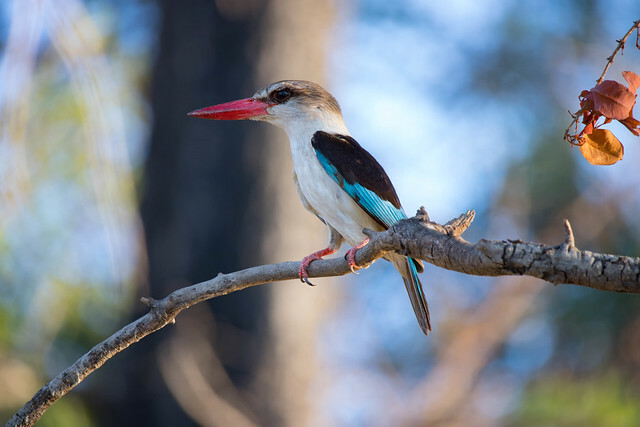 Our guide spied this handsome fellow on our second sunset cruise on the Zambezi River while at Waterberry Lodge in Zambia. He doesn’t show it, but this brownhooded kingfisher just swallowed a cicada that was as big as his head. Seriously. We we first came up to him, we were all trying to figure out what he had in his mouth. It took a couple of false-starts, but after a couple of minutes, he swallowed it whole. We hung around for another few minutes to make sure he was okay. Before long, he hopped up a couple branches and then flew away. 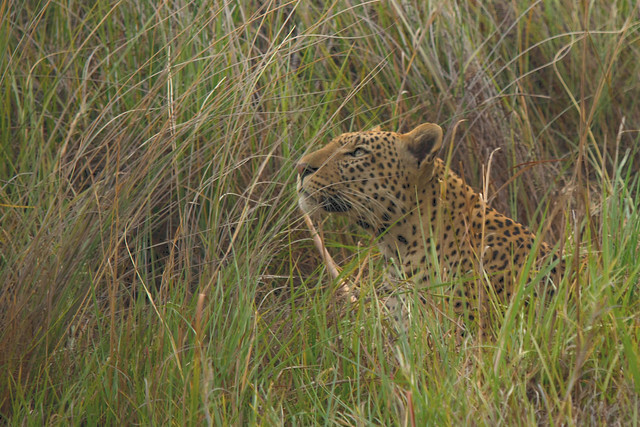 Remember those mating leopards we spied at Kwara? We sat and watched them for a while. They would go at ti for a while, then take a break. Between their…um…dalliances, they would separate just a bit and maybe curl up. During one of those breaks, I caught the male in the grass like this. 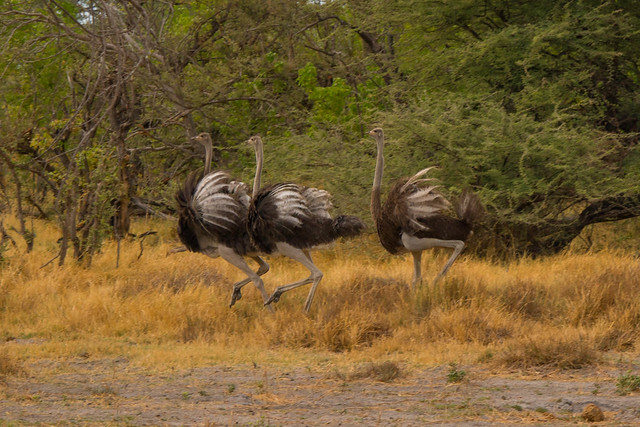 We didn’t see many ostriches on our safari – a couple individuals, and then this group that we found in Kwara. 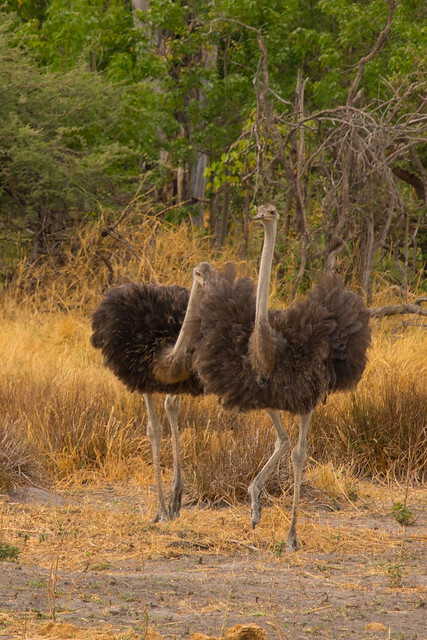 We came upon this group consisting of a male and several females in an opening in the Okavango Delta. 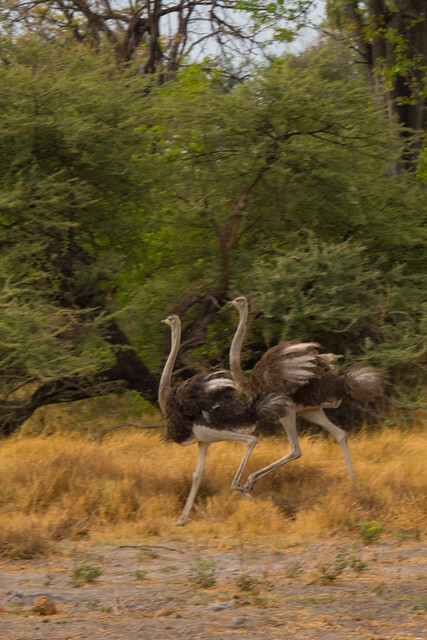 They tolerated our presence for just a minute, and then got upset and ran to the far side of the clearing. 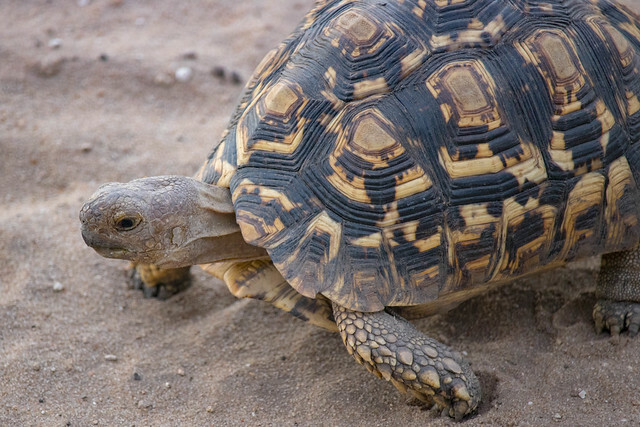 While we were on a drive in Chobe, Andrew called out, “hey, what’s that guy?” The guide stopped and told us that Andrew had found the leopard tortoise. I’m not sure how Andrew picked him out, but I’m glad he did! We didn’t catch all of the little five, but this would have been my top choice among them. 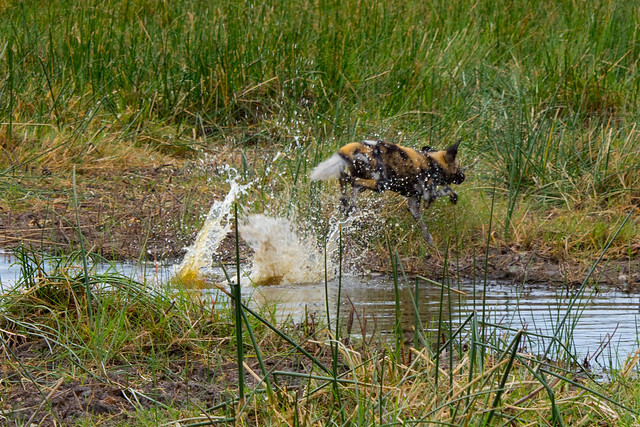 In Africa, the “Big Five” are the must-see animals for many folks (or in previous eras, must-kill for hunters). They are the water buffalo, lion, elephant, rhino, and the leopard. These are considered the most dangerous animals to hunt. For those aiming a little smaller, there are the “Little Five” – the elephant shrew, buffalo weaver, leopard tortoise, antlion, and rhino beetle. On our travels, we found the leopard tortoise, antlion, and (maybe?) the buffalo weaver. On our boat trip during our full day in Chobe, we spied this guy on the shore. 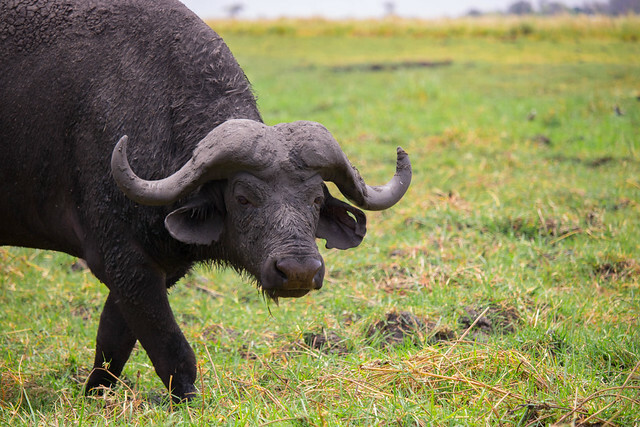 He was our first water buffalo (unless you count the carcass we saw the lions munching on). We saw a few more throughout our stay, but this was definitely the best look we got – the others were either further away or running away, or both. 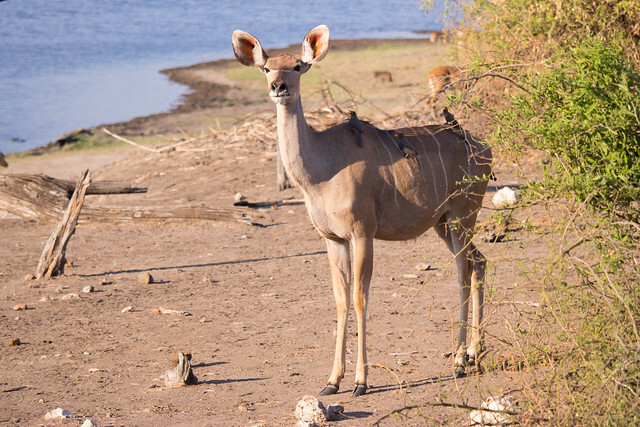 While we were on a drive in Chobe, we stopped for while near the river just watching the herds of zebras, kudu, and impala. 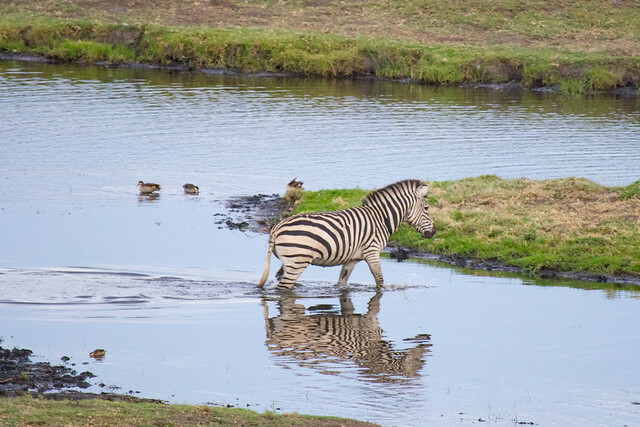 Our guide noticed this zebra about to cross, and drew our attention to it, knowing the reflection would make a nice picture. 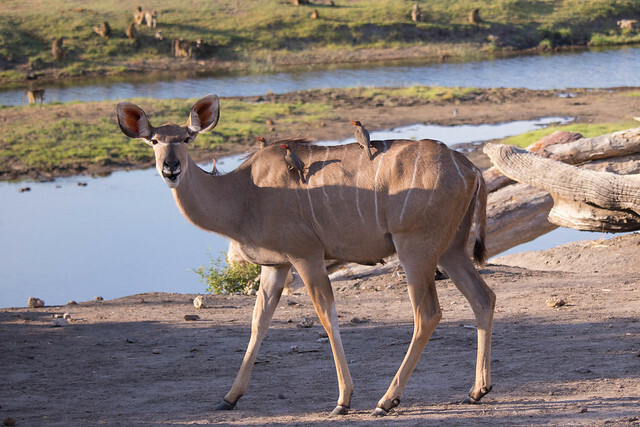 On our first game drive in Chobe, one of the antelope we saw was kudu. Many of them had bird friends who I assume eat insects off of them. Not much else to say about them, but love the goofy looks on their faces. On one of our game drives at Pom Pom Camp in the Okavango Delta, we came across a pride of females and their young cubs eating a kudu. One of the cubs, though, wasn’t interested in just sitting around and eating. 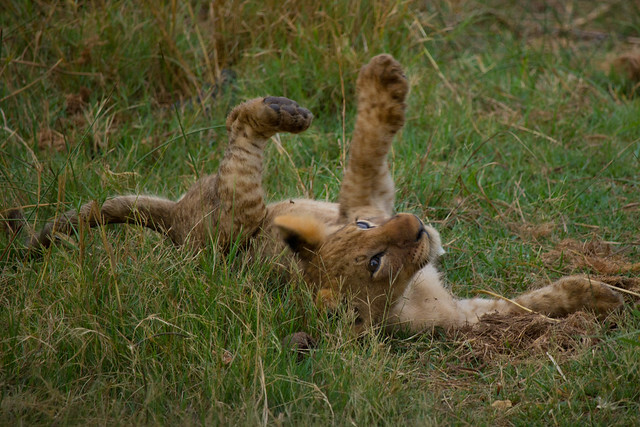 Instead he prowled around, tried chewing on the kudu’s ear, went after the horn, and crawled over the other lions. Of course this one was my favorite.